Chicken for Breakfast. It's Not as Crazy as You Think. Imagine, if you will, a world without lightbulbs or telephones. Art without Michelangelo. Music without Beethoven. It seems crazy, right? Unimaginable even. That’s how we feel about breakfast without chicken. But, we know not everyone wakes up thinking about tender, juicy chicken like we do. At least, not yet. On July 30, Chick-fil-A is rolling out a new ad campaign that will hopefully get customers just as excited about Chick-fil-A’s breakfast, especially the new Egg White Grill, as we are. The theme of the campaign is “Chicken for Breakfast - It’s not as crazy as you think.” The stars? Six historic figures—Susan B. Anthony, Beethoven, Alexander Graham Bell, Amelia Earhart, Thomas Edison and Michelangelo—whose ideas were considered a little loony for their time, but who went on to achieve incredible things. In the charmingly quirky ads, these legendary innovators eat the Egg White Grill and, to the surprise of their peers, they love it. 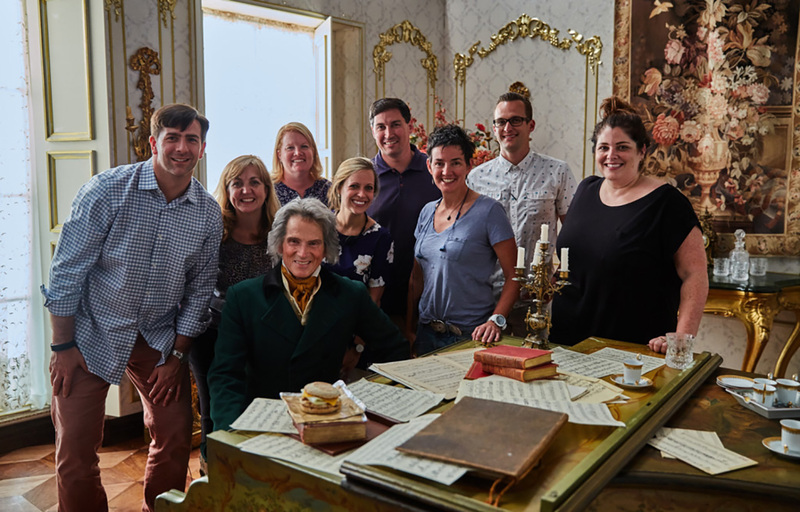 The Chick-fil-A Brand Strategy and Media Team on set with Beethoven (Dustin Britt pictured second from right). Speaking of lighthearted and funny, Kallman and Britt share a few of their favorite moments from filming, like when the actor who played Beethoven stayed in character, even when the cameras weren’t rolling. “He would walk around and, in his Beethoven voice, say things to the crew like, ‘Welcome to my parlor!’,” Britt says. While the silly scenarios are far from reality—we’re pretty sure Amelia Earhart never snapped a selfie from the cockpit—one aspect of the commercials is very real. The Egg White Grill breakfast sandwiches shown in the ads were crafted from scratch right there on set using our very own equipment and ingredients. Now that you know chicken and breakfast go hand-in-hand like Edison and the lightbulb, do yourself a favor and get to the nearest Chick-fil-A to try the Egg White Grill, and let us know what you think.